Why buy an expensive lift chair, when you can buy the Uplift to satisfy those needs almost anywhere you go? The Uplift Seat Assist is a self-powered lifting cushion that assists you gently up and down from any armchair or sofa. The Uplift's gentle action relieves stress and strain on painful joints, and eliminates the need to "rock" out of your seat. Even those of you who currently need "a pull" to get up can rest assured you won�t any longer: Uplift is strong enough to lift up to 80% of your weight. It is easy to use, and takes only seconds to adjust to your correct weight setting. You'll find the Uplift very helpful in your home - especially in the kitchen, dining and living rooms. Easy To Use: Simply select one of six settings closest to your weight and Uplift is ready to use. Secure: Non-slip material bottom ensures Uplift stays in place and doesn�t shift. Comfortable: High density foam cushion is molded to body contours for extra comfort. 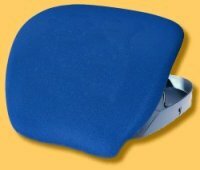 BackBeNimble offers the V-foam padded Uplift Assist Seat products. V-foam is a visco-elastic, slow release foam also known at memory foam, that protects from pressure sores and provides added comfort. Portable: Uplift flattens for easy transport. A built-in handle makes it easy to carry anywhere. Quality: Fire retardant, waterproof coating protects the surface of the foam cushion. Low Profile: Uplift only adds an inch and a half to the height of your seat when you sit on it. Comes with a standard Black removable and machine washable seat cover. PLEASE NOTE: MEDICARE INFORMATION IS PROVIDED ONLY FOR YOUR CONVENIENCE FOR POSSIBLE RE-IMBURSEMENT. BACK BE NIMBLE DOES NOT ACCEPT MEDICARE OR OTHER INSURANCE FOR PAYMENT. 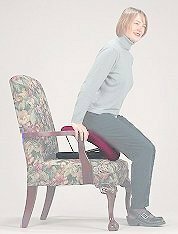 The Uplift Seat Assist is Medicare approved Durable Medical Equipment (DME) under HCPCS Code E0629; separate seat lift mechanism for use with patient owned furniture non - electric. The seat lift mechansim (i.e.Uplift Seat Assist), must be part of the physician's course of treatment and be prescribed to affect improvement, or arrest or retard deterioration in the patient's condition. Medicare requires a Certificate of Medical Necessity, also known as a CMN, to be completed and signed by your physician, based on your medical condition. If you qualify, Medicare will pay for 80% of the Medicare allowable cost of your Uplift Seat Assist. To find out how much your state covers, see the table below.